24 year old Lieutenant Andrew Dickson landed at Sword Beach early on D-Day with 2nd Battalion, the East Yorkshire Regiment. 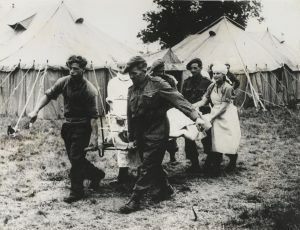 He was wounded not long after he landed in Normandy and was being repatriated back to Britain by ship on 7 June when the vessel was attacked, and he was killed. Reproduced courtesy of the Council of the National Army Museum. Originally from Southern Rhodesia (now Zimbabwe), Lieutenant Andrew Dickson is buried at Hermanville War Cemetery in Normandy, not far from where he originally landed on 6 June 1944. Lieutenant Andrew Dickson’s sacrifice will be acknowledged and commemorated when he is named on the British Normandy Memorial. He was one of the 22,442 soldiers, sailors and airmen from Britain and more than 30 Allied nations who gave their lives on D-Day and during the Battle of Normandy whilst serving with British units. There is no permanent British memorial to recognise their sacrifice. With your support, we can build a long overdue memorial to each of them. You can donate to the campaign by visiting this link.